Two days after Alex's wedding on 6 October, our son Jamie left for his Florida home aboard the 1983 Suzuki GS1100E that I had just given him. 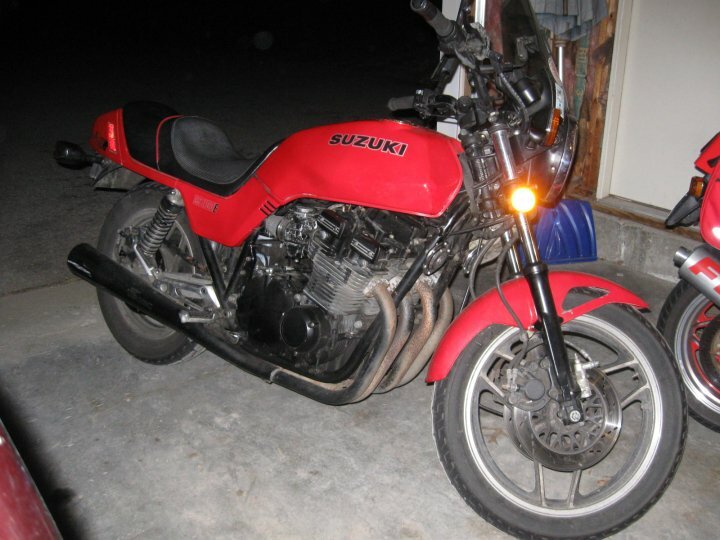 Big Red Suzi is not new, but he is running like a new motorcycle, thanks to the years of TLC that Matt Gordon at QBR in Littleton (Phone: 1 (603) 444-2359) and I have given him. A couple of weeks earlier, I had equipped Suzi with a new Metzler rear tire, to keep my fine son Jamie, 35, who will become a father in March, from riding so far on a rather worn rear tire. On the first day of his ride South, near Poughkeepsie, New York, at an estimated 60 MPH (~100 KPH), Jamie acquired the large Phillips Head screw seen here. Thanks to his many years' experience, much spent in the uncertain traction of dirt riding, Jamie "saved" the heavily laden and surely squirrelly superbike from a crash. 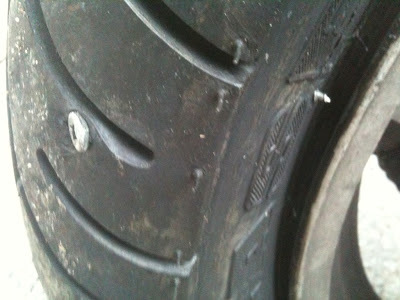 With the help of a tow truck and Shirl's Internet research, he had a another new tire installed at a Poughkeepsie motorcycle dealer, and was back on the road that evening. JJ is home now in Orlando. Thank you, dear God! Alas Duncan, Matt Gordon is gone from QBR. I called QBR last week to order a rear tire for my 1958 Jawa 350 and got Matt on the phone and ordered a the same IRC 3.50 16 as the last one. On Friday I drove to QBR and there was my new tire leaning against the parts counter. Quint was there but no Matt. Quint said rhat Matt was "all done". Matt made QBR and is missed. Alas, indeed, Pete! I will follow-up on this news!